Italian Cheese - Pour a pint of Cream into a large stone bowl, put to it the rind of a Lemon grated & the juice, a coffee cup full of White Wine sweeten it to your taste, then with a Whisk beat it a qr of an hour till it is very thick, take a piece of muslin lay it on a Sive, then pour in the Cheese let it stand all night to drain turn it out upon a Dish with care, NB the cream should be thick Mrs. F. Blackburn Strawberry Wine 6 quarts of Fruit to one Gal. 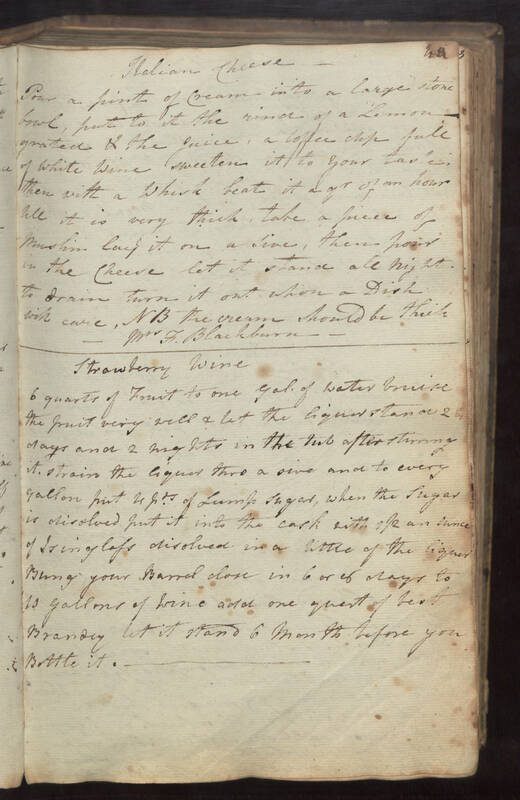 of water bruise the fruit very well & let the liquor stand 2 days and 2 nights in the tub after stirring it. strain the liquor thro a sive and to every gallon put 4 pds of Lump sugar, when the sugar is disolved put it into the cask with 1/2 an ounce of Isinglass disolved in a little of the liquor Bung your Barrel close in 6 or 8 days to 1 gallons of wine add one quart of best Brandy let it stand 6 months before you Bottle it.